An eastbound operator told me that Hall failed, so I was able to get a picture as the train I was riding westbound went through. I heard the gate at 185th before Willow Creek failed too, but I got off my train at Elmonica and by the time I went through Willow Creek later in the evening it had been repaired (as was the gate at Hall). So if you experienced a delay in your MAX commute on the westside today, this is part of the reason why – each westbound train had to call Control at Beaverton Transit Center, each eastbound train had to call Control from Beaverton Central, and then in both directions trains had to come to a full stop and sound warning before proceeding through the intersection – and if the gate at 185th was down as well, that was another stop & delay. All in the name of safety though! They’re one of the many safety features built into the system. 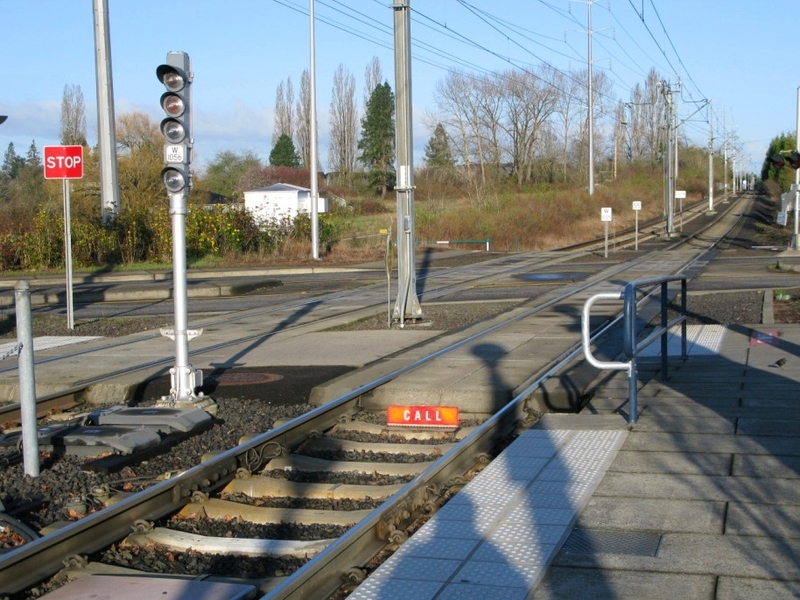 When a call board is up, an operator MUST call Rail Control over the radio before doing anything at that platform aside from opening their doors. They cannot leave that platform or select their signal (at platforms where that’s applicable) until they get permission over the air from Control. There are a number of reasons why a call board might be up. Two that I’ve seen most frequently are for track personnel and crossing gate failure. The most common use of call boards is for authorized personnel in the track – this can be anything from people doing maintenance on the switches, cleaning litter, or doing a walking inspection of the rails and overhead lines. So for example, if personnel are going to be walking down the tracks along I-84, it’ll be typical for call boards to be up at Lloyd Center for eastbound trains and Gateway for westbound trains. When an operator calls Rail Control at either of those locations, Control will contact the personnel doing the inspection to confirm their location and ensure that the train operator knows where they will be. The train will then operate at reduced speed away from the platform, giving audible warning to the personnel, and then resuming normal speed once they’re clear of the area. Obviously this is a HUGE safety issue – normal operating speed in some areas of the alignment is 55mph. Consider what could happen if there were personnel in the tracks and the operator, not knowing they were there, went down the tracks at full speed. 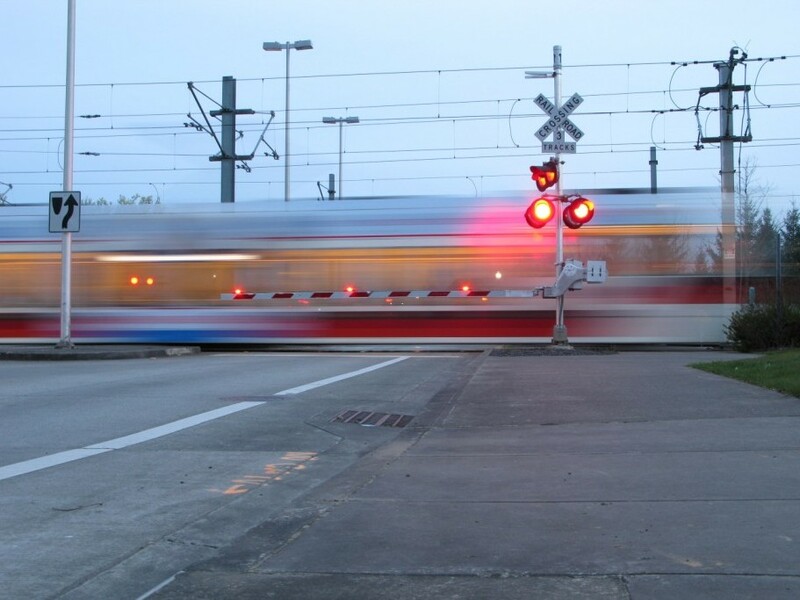 Requiring operators to contact Control when they see a call board ensures that they know where to expect people in the tracks and can proceed at a slower rate of speed until clear of the area. No TriMet employee has ever been killed by TriMet light rail, and using a setup like mandatory calls like this is a big part of the reason why. The reason why an operator can’t select their signal at a platform without permission if a call board is up is that at many platforms, selecting a signal will also throw switches on the alignment, in locations not always visible from the platform. If a worker has their hand or a tool in the switches and the switch suddenly moves, serious damage can occur. The second use of call boards that I’ve seen has been when crossing gates fail. I have no pictures of a broken gate, so here is a crossing gate that is working properly – the slightly long exposure shows that all of the mast lights and arm lights are working – normally they are flashing lights. EDIT – on April 5, 2010 I got a picture of a failed gate arm. First, a gate has malfunctioned if one of the mast lights are dark or if one of the gate arm lights are dark. In these situations, the gate will be reported to Control so it can be fixed, but movement through it can proceed as normal. A gate is considered failed if more than one of the mast lights is dark, or if more than one of the arm lights is dark, if a mast light AND an arm light are both dark, or if the gate is obviously broken (gate arm on the ground or stuck in the upright position, car crashed into it, etc). Federal regulations come into play when this happens. So when a gate has failed, a train is required to call Control from the platform prior to the broken gate. At the crossing with the failed gate, the operator must come to a complete stop, sound horn warning, and proceed when safe – even if there is a supervisor or police officer directing traffic at the intersection. 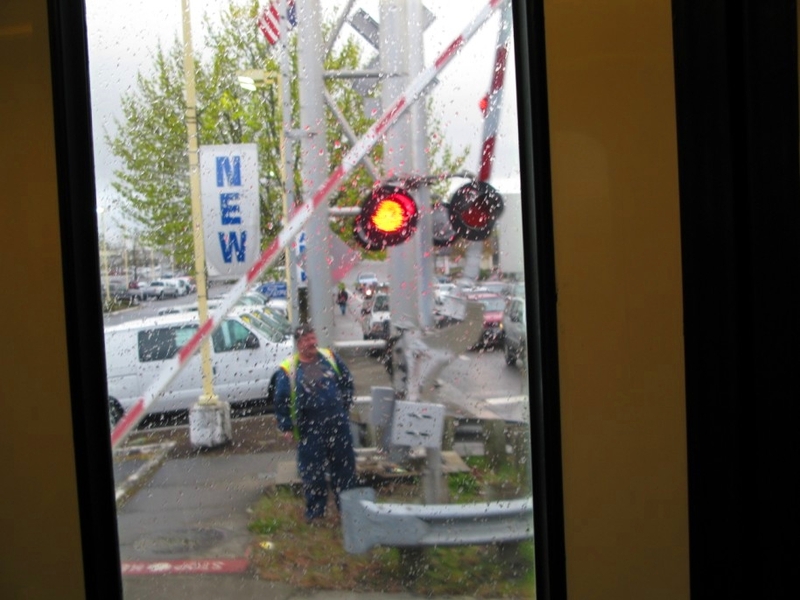 Once again, you can see the importance of the call boards – they are a reminder ensuring that the train operator knows that they will have to come to a complete stop at the next gated intersection because gate protecting it has failed.